Nuclear power is frequently promoted as a necessary msolution to global warming, and a key means to achieve emissions goals. This is a major mistake, according to a new report published by the Rosa Luxemburg Stiftung‒ New York City. The report ‒ “Nuclear Power and Climate Action: An Assessment for the Future” ‒ presents an industrial analysis of nuclear energy to assess its viability as a climate solution. From real and practical evidence, the report concludes that nuclear power is not a viable tool in the climate solutions toolbox, and that nuclear- free paths to phasing out greenhouse gas emissions are necessary, feasible, and cost-effective. With the immense threats of climate change, it is tempting to overlook other environmental hazards in the effort to address it. 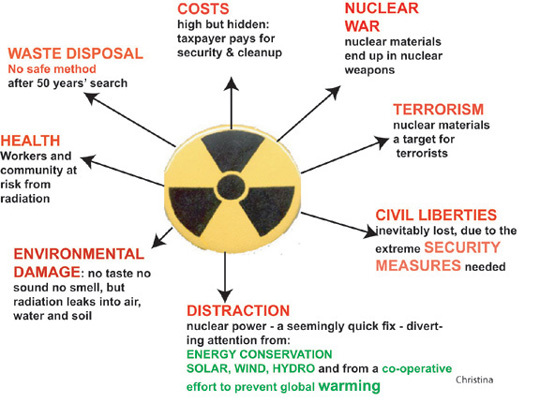 That is a mistake with nuclear power especially, because its environmental impacts are so severe and long-lasting and so many of them intersect with and compound impacts of global warming as well as issues of climate justice. At every stage of its production ‒ from uranium mining to the production of radioactive wastes ‒ nuclear power pollutes the environment with some of the most dangerous, long-lived contaminants in the world and places undue stress on water resources. Because fossil fuels make up 86% of global energy, decarbonization will require a total transformation of energy systems in most parts of the world. Renewable energies have proven to be the most promising option ‒ complemented by investments in energy efficiency, development of complementary technologies, and integrated reliably and resiliently. Evidence from places like Germany and California shows that nuclear power does not integrate well with renewables and phasing it out is likely to create greater opportunities to accelerate the phaseout of fossil fuels and the transformation of the energy system. The report includes case studies showing that promotion of nuclear power entails significant climate opportunity costs, wasting time and financial investments that could reduce greenhouse gas emissions and decarbonize energy systems much more rapidly and cost-effectively. For instance, in the United States, the Summer 2 and 3 reactors were cancelled after major cost overruns and construction delays bankrupted their manufacturer, after US$9 billion had already been spent. Had utilities invested in energy efficiency and renewables, the report finds, the utilities would have made substantial reductions in emissions and reduced electricity costs for their consumers. Similarly, the state of New York in the US decided in 2016 to subsidize four aging, uneconomical reactors, at a projected cost of $7.6 billion by 2029 ‒ three times as much as will be spent to achieve 50% renewable energy standard in 2030. Had New York invested in energy efficiency instead of nuclear, it could achieve greater emissions reductions in 2030, at a cost reduction of $10.6 billion. The report concludes that the primary obstacles to rapidly phasing out fossil fuels and greenhouse gas emissions are political, not technological or economic. In particular, deceptive interventions by corporations invested in fossil fuels and nuclear energy have engendered inertia and confused the debate by, alternately, denying the reality of global warming and by presenting false solutions. Mitigating the economic and social impacts of climate action by ensuring a just transition for workers and impacted communities is key to charting a clear vision and building and sustaining the political will to accelerate emissions reductions and the phase-out of greenhouse gas emissions.